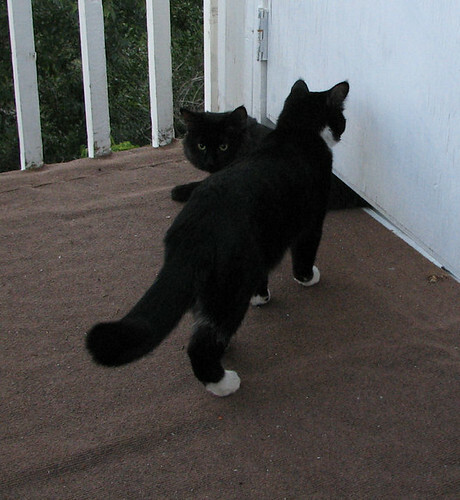 We've had a couple of stray cats showing up on our balcony in the last while. Today was the first time both of them showed up at the same time. My younger daughter has named this one Freya. When we first saw her, she still had an old red collar around her neck. The first time we saw her without it, you could see a patch of skin where the fur had been rubbed all, and a smaller area where the skin was rubbed raw. Clearly, this had been a house pet. She loves cuddles. Every time she comes to visit, she's rubbing all around our legs and rolling on the floor of our balcony. When we sit on the patio swing, she likes to sit beside us for pets. This time, she was comfortable enough to climb into my daughter's lap and even started to doze. She doesn't like to be picked up, but if you pick her up and put her down beside you, she immediately starts to purr and snuggle. While I was taking pictures of Freya beside me on the swing, we heard some meowing and off Freya went to check it out. 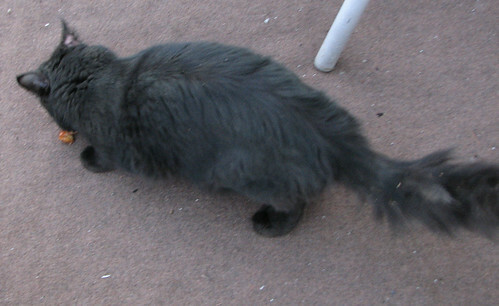 Here, the other stray - my daughter has named her Horatio - is squeezing under the door to the fire escape. They seem to know each other, and be comfortable with each other. As you can see, Horatio is in rougher shape. Though more cautious than Freya, Horatio also seems to have been a house pet and is very friendly. She's constantly on the move, so it was hard to get a good picture in the fading light, even after giving her some food. 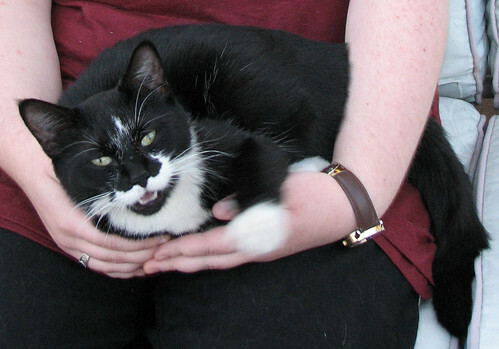 She will lie on the seat of the patio swing as well, accepts pets, but is not quite as cuddly. She's more nervous, and I think she's seen some mistreatment. That doesn't seem to stop her from seeking out human company! My daughter is still out on the balcony with both of them, in her glory. Sadly, we already have 2 cats and that's the limit for pets in our townhouse. Not that our cats like seeing these two around! They'll sit in the window and hiss at them. With winter coming, they are going to need some shelter. Time to ask a friend at the pound for advice. UPDATE Sept. 22, 2011: Well, now. The first thing my friend suggested was to see if they have microchips, so I took them in to an animal hospital to have them checked. They were really great about going into the old dog carrier (went in voluntarily) we have. They were checked thoroughly, but have no microchips. Horatio, however, was hiding a secret under that long fur. Testicles. Yes, Horatio is a male. No surprise, then, that Freya appears to be pregnant. I was hoping that belly she was getting was because she was finally getting enough to eat. There are so many cats at the SPCA and the pound, that we're going to see if we can adopt them out on our own. The chances that they will be euthanised is too high for our comfort level. 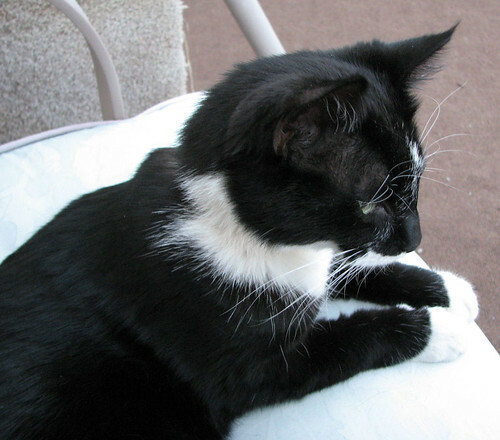 They are such sweet and affectionate cats, but who would be willing to take on a pregnant cat? hope you'll find a good friend soon who takes care of those 2 sweet little cats :) good luck! Adorable kitties. I have 3 rescues myaelf. I wonder why people abandon their pets? Probably for financial reasons. I hope you find homes for them. My food is looking at me.